Is there anything worse than forgetting to pick up a crucial ingredient at the grocery store? That's what happened the night I made this chickpea salad with roasted vegetables. I could've sworn I had grabbed a package of mushrooms and added them to my cart, but when I was unloading groceries at home the mushrooms were nowhere to be found. This was back in early January, so I can't even blame new-mom exhaustion! It was a freezing cold night and we were hungry for dinner, so I pressed on with the recipe, despite the lack of mushrooms. I'm pleased to report that the absence of mushrooms did not ruin the recipe (good news for all you [weird] mushroom-haters)! 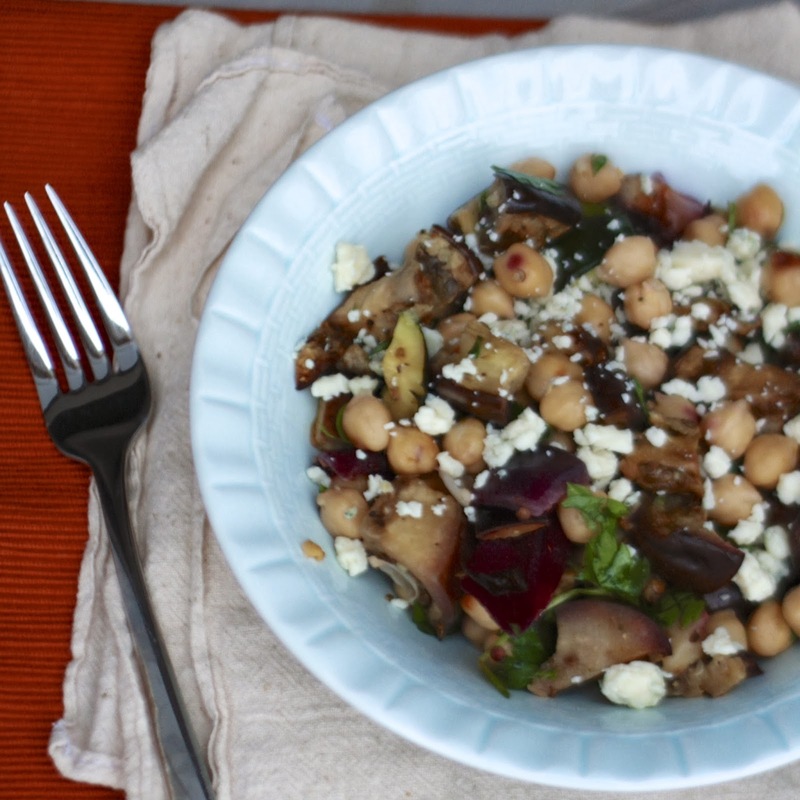 Aside from the time needed to chop and then roast the vegetables, this meal comes together quickly...just toss your vegetables with chickpeas, parsley, and feta. There isn't dressing, save for the lemon juice, but there's enough flavor from the other ingredients that you don't need anything else! Meals like this are proof that healthy eating can be cheap, easy, and satisfactory...even without the mushrooms! 1. Preheat oven to 400F. Line 2 baking sheets with foil and spray with cooking spray. Cut the zucchini, onion, eggplant, and mushrooms into 1-inch pieces. 2. In a large bowl, combine the garlic, olive oil, oregano, salt, and freshly ground pepper. Add the vegetables and toss to coat. Spread the vegetables on the prepared baking sheets, spreading in an even layer. 3. Roast for 45 minutes, or until golden brown on the edges (stir once halfway through). 4. While vegetables are roasting, drain and rinse the chickpeas. 5. Allow vegetables to cool for 5 minutes before tossing with chickpeas, parsley, and feta. Squeeze lemon juice over the mixture and gently stir, seasoning with more salt if desired. Serve immediately.